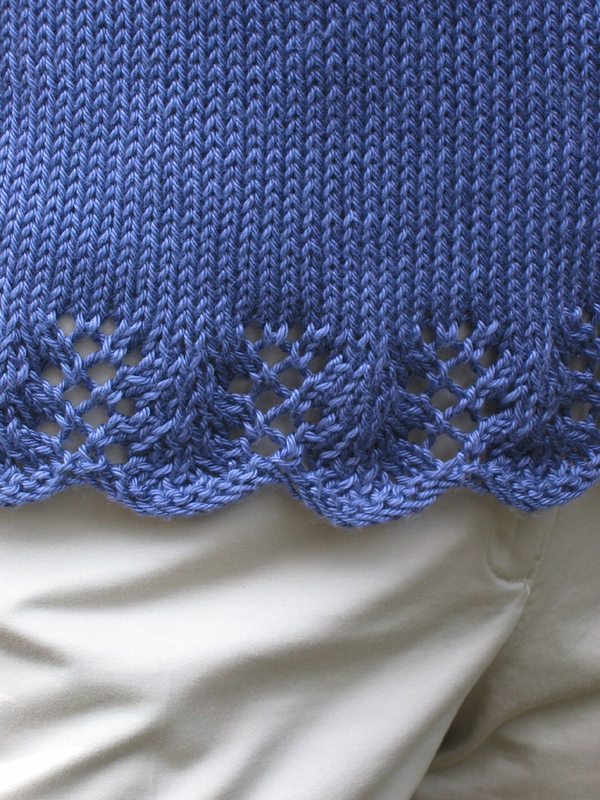 I finally finished the Lace Hem Topping as shown on the July 2008 cover of Creative Magazine. It took several tries to get the crochet edging so it looked good and laid flat. I should block it again but it can now go into my FO folder! Modifications: Many. I used a lighter weight yarn (DK) instead of the worsted weight the pattern called for and also a smaller needle to get a gauge that would relate to one of the sizes. I used the size 46 (X-Large) directions for everything but the size 38 (medium) for the length. 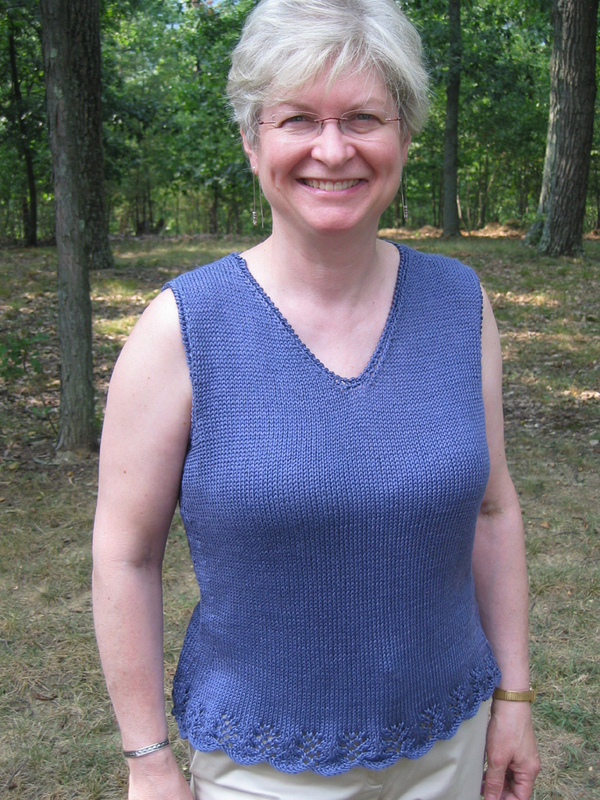 It was a great knit even though I got frustrated and had to rip back to the armhole shaping and reknit both the front and back. I made the armholes too long and couldn’t live with them that way. I think it took longer to reknit the second time and learn how to do the crochet edging than knitting it in the first place. Beds need to be made. Floors need to be scrubbed or vacuumed. Islands and counters need to be cleared. Bathrooms need to be refreshed. Knitting needs to be out of reach from toddlers and dogs. OK, maybe moving the knitting will be the last thing I do Friday evening but I want to do the rest of my list this morning so I can devote the rest of the day and upcoming evenings to knitting. This entry was posted in cleaning, finished objects, knitting and tagged cleaning, declutter, finished object, knit, knitting, Lace Hem Topping by Patti_is_knittinginflashes. Bookmark the permalink. This is beautiful, and the color looks beautiful on you! I have been wanting to knit with that ultra pima. It feels wonderful and is so pretty. Yay for your beautiful FO!